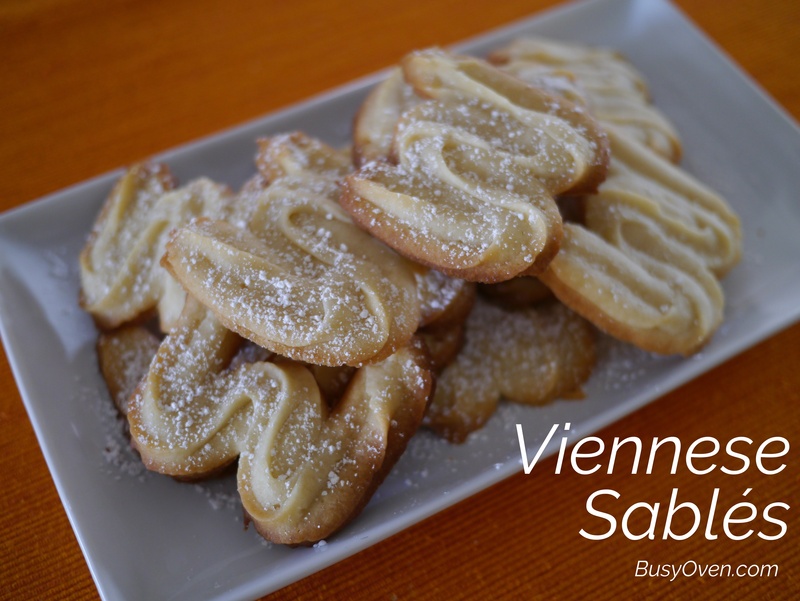 Viennese Sablés remind me of fancy butter cookies. It’s impossible to be satisfied eating only one of these cookies; who can resist a crispy, buttery, mildly sweet cookie? This recipe from Dorie Greenspan’s Baking Chez Moi, where she explains some of the different reasons why these cookies are “W”-shaped. In short, it could be either because they came from a pâtissier named Wittamer, or because of the location this cookie was created: Wien (German for Vienna). I have been wanting to try this recipe for quite some time, but I never got around to it for whatever reason. I’m kicking myself now for not making these sooner! They’re very simple to make, and the piping is fun, too! Only 6 ingredients are needed: butter, confectioners’ sugar, salt, an egg white, vanilla extract, and all-purpose flour. The cookie dough is very easy to make. All it takes is combining the dry ingredients with the wet ingredients. The fun part is piping the soft dough out into W’s with an open star tip. Into the oven they went, and out came these beauties! The hardest part of this recipe was waiting for these cookies to cool. They smelled great fresh out of the oven! Not bad for my first try, but they’re a bit of an eyesore compared to the ones pictured in Baking Chez Moi. The cookie alone is nice and buttery, and has a hint of sweetness. A dusting of powdered sugar adds the perfect amount of sweetness to these cookies. These cookies are delicious and very easy to make. I will definitely make these again! Viennese Sablés recipe on page 263 of Baking Chez Moi.